An all-star lineup of local and national death penalty activists will convene at 6 pm, Saturday, November 8th at The Sanctuary Church in Fort Lauderdale to demand a repeal of Florida’s capital punishment law. 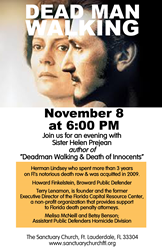 Speakers include “Dead Man Walking” author Sister Helen Prejean, Broward Public Defender Howard Finkelstein, Florida death row survivor Herman Lindsey, and many more. Murder, whether it’s committed in a back alley or in Florida’s execution chamber, should be equally offensive to people’s moral sensibilities. Is the death penalty immoral? Is there a legitimate, rational justification for maintaining the death penalty in a modern, civilized society? These are just a few of the questions that will be addressed Saturday, November 8th at 6:00 pm when top national and local anti-death penalty activists convene at The Sanctuary Church in Fort Lauderdale (located at 1400 N. Federal Hwy) to demand an end to Florida’s capital punishment law. The event, called “Thou Shall Not Kill,” is expected to bring in over 700 participants who will also be signing a petition to repeal Florida’s death penalty law. Headlining the November 8th event is Sister Helen Prejean, a leading American advocate for the abolition of the death penalty. Best known as the author of “Dead Man Walking,” which was turned into an award-winning film starring Susan Sarandon and Sean Penn, Prejean has served as a spiritual counselor to death row inmates for over 30 years. Founded in 1961, The Sanctuary Church of Fort Lauderdale is an active member in a number of social causes, including prison ministry, substance abuse, racial justice, homelessness and more. The Sanctuary recently served as the funeral site for Fort Lauderdale Fire Lt. Kevin Johns, who was killed September 30th while changing a flat tire on I-95. For more information about the November 8th “Thou Shall Not Kill” event, please visit http://www.sanctuarychurchftl.org or contact Pastor Dwayne Black at 954-564-7600, dwayne(at)sanctuarychurchftl(dot)org.